It is exciting for us to see the amazing growth of the R Markdown ecosystem over the four years since the creation of R Markdown in 2014. Now you can author many types of documents, and build a wide range of applications based on R Markdown. 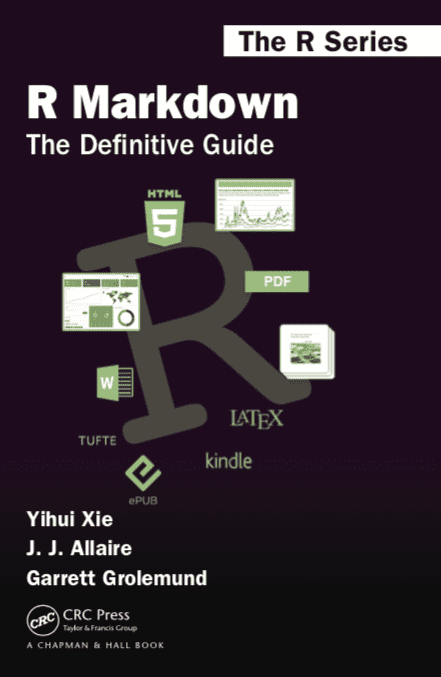 As an effort to unite and improve the documentation of the R Markdown base package (rmarkdown) and several other extensions (such as bookdown, blogdown, pkgdown, flexdashboard, tufte, xaringan, rticles, and learnr) in one place, we authored a book titled “R Markdown: The Definitive Guide”, which is to be published by Chapman & Hall/CRC in about two weeks. You can pre-order a copy now if you like. Our publisher is generous enough to allow us to provide a complete online version of this book at https://bookdown.org/yihui/rmarkdown/, which you can always read for free. The full source of this book is also freely and publicly available in the Github repo https://github.com/rstudio/rmarkdown-book. Please feel free to let us know if you have any questions or suggestions regarding this book. You are always welcome to send Github pull requests to help us improve the book.1 We hope you will find this book useful.